Why people get killed over blasphemy in Pakistan. 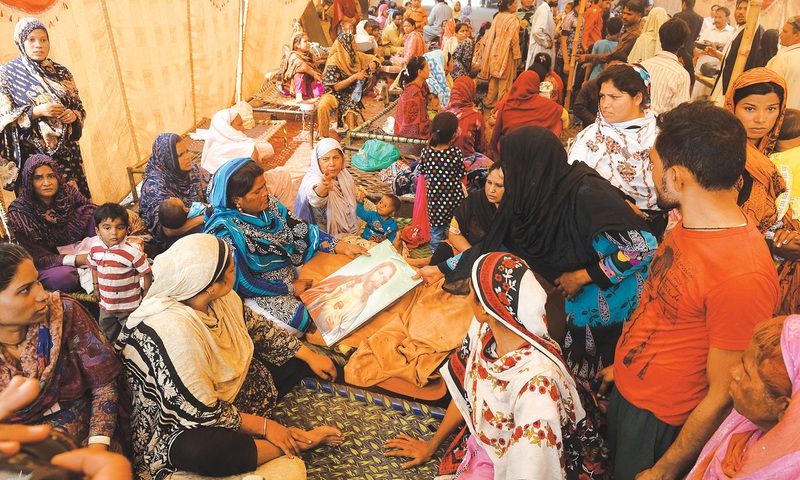 Christian women mourn after the Jospeh Colony attack in Lahore in 2013. Credit: M Arif/White Star. Courtesy of Herald. The lawyers looked pointedly at their feet. According to the Centre for Social Justice, a Lahore-based research and advocacy group, at least 62 men and women have been killed on mere suspicion of blasphemy between 1987 and 2015. So far, no one has been executed by the state. 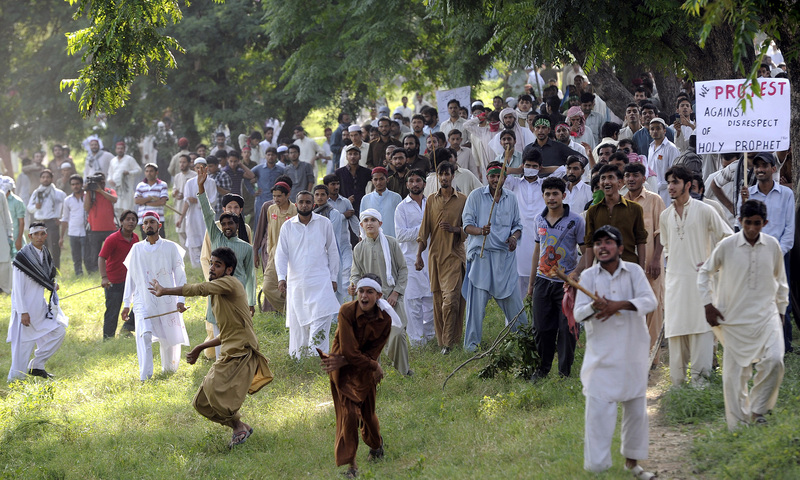 In this particular manifestation of an increasingly familiar phenomenon, on the morning of November 4, 2014, Shama and Shahzad Masih were dragged out of the 10-by-10 feet room in which they had sought refuge earlier that day, bludgeoned with sticks and hatchets by a mob that eyewitnesses say numbered in the high hundreds, then – and here accounts diverge – tied to a tractor, lugged across crushed stones on a half-constructed road, doused with petrol and flung into the brick kiln where they would both have gone to work the next day, had Shama not been accused of desecrating the Quran. She was one of at least 1,472 people who have been accused under the blasphemy laws between 1987 and 2015 – specifically under sections 295-B, 295-C and 298-A of the Pakistan Penal Code. As estimated by the Centre for Social Justice: 730 of these are Muslims, 501 are Ahmadis, 205 are Christians and 26 are Hindus. The religion of the remaining ten could not be ascertained – they were killed before any legal proceedings were initiated. There was initially a great deal of public fury and wholesale condemnation, after Shama and Shahzad were burnt to death, followed by what some chose to view as heartening signs, whatever that could mean in a situation of this sort. Human rights campaigner Asma Jehangir thought that the response from the religious parties was positive. The state said it would be a chief complainant in the case. People were rounded up and arrested. 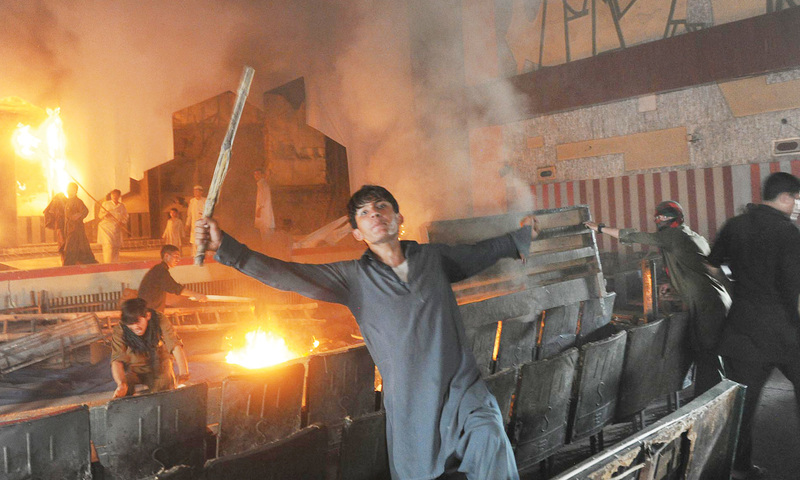 But slowly attention moved on to other things: the factory fire in Jhelum that targeted Ahmadis who were alleged to have blasphemed, the boy who cut off his own hand in Hujra Shah Muqeem town to punish himself for what he considered as constituting blasphemy. “Woh joh bhattay pe sarr g’ay,” recalled one man, himself Christian, but from Lahore, about six months after Shama and Shahzad’s death in the adjoining district of Kasur. Consider the curiously passive construction of his sentence: those who burnt to death at the brick kiln, not those who were burnt to death, as if spontaneous combustion were somehow the cause. In district Kasur’s Chak-59, a stone’s throw away from the murder site, Muhammad Ilyas says his son had nothing to do with it. He pauses to light a cigarette, holding it between two trembling fingers. He exhales slowly. It is the only plume of smoke in the distance: the brick kilns lie dormant on that summer day in 2015. Every Wednesday, Ilyas visits his son, who he says is unjustly locked up in Shadman jail in Lahore. He himself spent four days there in November 2014, released only when his cough, a hacking sound that wells up from inside him, even as he continues to smoke, became worse. The scale and pace of life in Lahore both exhaust and unsettle him: when he tried to cross the road outside the jail last week, a motorcyclist nearly trampled his toes. He wiggles them now, for effect. No one in Chak 59 would say who the hundreds of men were whose rage led to the death of Shama and Shahzad, though they all concede, with an air of pronounced reasonableness, that the deaths did take place. “They came from outside,” Ilyas insists, referring to the mob. This is conspiracy theory number one in almost all mob attacks over accusations of blasphemy. The crowd that has assembled around Ilyas nods in agreement. As Ilyas continues speaking – “Shama’s sister had converted to Islam, that was at the heart of everything” – a voice emerges from the crowd. Ilyas stops speaking entirely, surprised into silence by a man who makes his way to the centre. The speaker hesitates, then decides to wade ahead. “How long have you lived here?” asks the man sitting beside Ilyas, observing the stranger closely. When Muslims ruled Spain, 48 Christians were said to have been executed on various charges of blasphemy and apostasy, between the years 851 and 859. They are remembered today as ‘the martyrs of Cordoba’. Their accounts were related by Eulogius, a monk who encouraged public declarations of faith as a way to assert the identity of a Christian community. Death that resulted from these declarations was the perfect solution: “ … not only did it epitomise self-abnegation and separation from the world, but it also guaranteed that there would be no opportunity to sin again,” Eulogius wrote. He was also eventually put to death and it is unclear if more Christians after him rebelled in a similar manner. Blasphemy as political or personal protest seems somewhat far-fetched in Pakistan’s current climate, but proponents of Pakistan’s blasphemy laws often cite this episode in response to the question of why someone would deliberately insult the majority religion. But even as the laws pertaining to blasphemy have grown stronger, the aftermath of accusations is increasingly unfolding outside the courtroom, presenting a strange and seemingly insurmountable dichotomy. The court in sweltering Lahore, after all, wasn’t adjudicating on the issue of blasphemy but rather on murders that resulted from it. How has blasphemy become such a deadly issue in Pakistan? It is possible, of course, to blame colonialism. When Lord Thomas Babington Macaulay, of “a single shelf of a good European library is worth the whole native literature of India and Arabia” fame, drafted the Indian Penal Code of 1860, he introduced a blasphemy law, imported from the British common law with some additional provisions – for instance, even words uttered out loud could be deemed offensive. Whether or not religion was the main dividing line among the residents of the subcontinent – after all, no one really knew the relative numbers of various groups, or the demarcation of what exactly separated one group from the other, until the first census was carried out in India in 1871 – Macaulay incorporated religion into criminal law, noted anthropologist Asad Ali Ahmed in Spectres of Macaulay: Blasphemy, the Indian Penal Code and Pakistan’s Postcolonial Predicament. He referred to religion as the “inaugural site of difference” in the subcontinent. It was a classic colonial move: for the imperial power to fashion itself as the impartial umpire between antagonistic religious communities to create or at least highlight differences and then step in to arbitrate. Even at the time, Ahmed wrote, there was concern about making wounded religious sentiments, even when they did not lead to public disorder, a cause for action. The English lawyer Fitzjames Stephen warned that it would be fine as long as English magistrates continued to interpret the law restrictively but it “might lead to horrible cruelty and persecution if the government of the country ever got into Hindoo or Mohammedan hands”. “Ki Muhammad se wafa tu nay tou hum teray hain” (only if you are to be loyal to Muhammad, will I be yours), wrote Allama Iqbal in Jawab-e-Shikwa, as part of God’s address to the Muslims. Indeed, the uproar for protecting the honour of Prophet Muhammad (may peace be upon him) was such during Ilamdin’s trial that the British were forced to intervene and add an additional clause to the blasphemy law. Nearly a century later, in the events that led to the murder of Governor Taseer, the verse was invoked again and again. Credit: Azhar Jafri/White Star. Courtesy of Herald. The blasphemy law was hardly ever invoked in all the early 20th century instances. Very few cases of blasphemy were, in fact, registered until the time of General Ziaul Haq, when new and stricter laws were added to those already existing. Religion had made a comeback of sorts all across the world then, thrusting itself into the public arena of moral and political contestation. The Islamic revolution in Iran, the rise of the Solidarity movement in Poland in protest against God-less communist suppression, the role of Catholicism in the Sandinista revolution and in other political conflicts throughout Latin America and the bloody occupation of the holy mosque in Makkah by a highly radicalised Salafi group gave religion the kind of global publicity that forced a reassessment of its place and role in the world. In our own backyard, the invasion of Afghanistan, a Muslim country, by a purportedly atheist imperial power, the Soviet Union, turned our society into an extended religious laboratory and our state an extended jihadi camp. These changes could be seen in the sort of books that were being produced in those years: Islamic polemics against the Ahmadis and the leftists by the likes of Agha Shorish Kashmiri, Islamic fiction by the likes of Naseem Hijazi and Islamic poetry by the likes of Hafeez Jullandhri who composed Shahnama-e-Islam, a verse history of the Muslim governments of the past (Jullandhri, at the time of writing the book, was working as an adviser to Ayub Khan). “So the person who read these [in the 1980s] is now a middle-aged man with set views,” Asif says in an interview. During the Zia era, the ideological framework of the blasphemy laws also became more complicated than it was during the British period: they were no longer intended to demonstrate state neutrality, but were an explicit state-administered defence of sacred Muslim persons and texts. This was a state that was shaping society as much as it was being shaped by it. “Underlying the original laws and their postcolonial additions is an unstable dynamic of incitement and containment — that is, the laws’ attempt to regulate wounded attachments and religious passions can conversely constitute them. They have in actuality enabled social groups to organise in order to ensure the state takes cognizance of blasphemous events and practices,” Ahmed, an assistant professor at Harvard University’s Centre for Middle Eastern Studies, wrote in his paper, Spectres of Macaulay. But, importantly, there have been no executions as yet. State officials have been particularly reluctant to intervene in disputes between Muslims, for fear that trials and executions will further sectarian conflict, he pointed out. The attempt to forge a bond between the state and the nation, according to him, founders on the numerical preponderance of blasphemy cases registered by Muslims against Muslims. The anecdote that Ahmed narrated in his paper to demonstrate this concerns a stand off between Ahle Sunnat – or Barelvis – and Ahle Hadith – or Wahhabis – over what transpired at a conference about the life of Prophet Muhammad (may peace be upon him). And it is pretty instructive: some young Barelvi men in Kamoke town near Lahore attended a gathering of Ahle Hadith. They claimed that two Ahle Hadith clerics implied during the gathering that Barelvis were like “dancing girls” and made fun of the Barelvi insistence on the Prophet’s intercessory role and perpetual presence. The Barelvis responded insult for insult 12 days later. The Ahle Hadith lodged a blasphemy case against them, invoking sections 295-A and 298 of the Pakistan Penal Code. The Barelvis responded to this by lodging a case under section 295-C that carries the death penalty. The state dragged its feet, so, eventually, they had to compromise. But no one was entirely happy. “It is this gap between the filing of the case and their inability to prosecute,” wrote Ahmed, “between their expectation that the government would perform its sovereign duty and its refusal to do so, between the law’s incitement to action and the administration’s tenuous regulatory capability that had led the blasphemy laws to become a site of passionate attachment and mobilisation and a site of disaffection and betrayal by the state.” That explains both violent protests over the caricatures deemed offensive and mob attacks that follow the real or perceived instances of blasphemy. For Barelvis, it is also a matter of waning political power – the realisation that Deobandis have institutional presence in a way that Barelvis do not. Through political parties such as Jamiat Ulema-e-Islam Fazl (JUIF) and, to a certain extent, Jamaat-e-Islami, which, by its own claim, is non-sectarian but most of its individual members are either Deobandi or Ahle Hadith, through government institutions such as the Council of Islamic Ideology, Federal Shariat Court, moon sighting committees and through the possession of state-built mosques and madrasas, Deobandis far outweigh Barelvis in the organised social sphere, even though the latter claim to be as numerous as the former, if not more. This then explains why Qadri and his death sentence became such a major flashpoint – it provided Barelvis an opportunity to demonstrate that they have street power like any other religious group in Pakistan. Having seeped into almost all aspects of national life, the spillover of the blasphemy issue has now, understandably, entered the political sphere as well; when Muttahida Qaumi Movement (MQM) and Pakistan Peoples Party (PPP) had a political spat year before the last, the former lodged a blasphemy case against the latter’s prominent leader, Syed Khursheed Shah, claiming the remarks he had reportedly made about the muhajirs, the migrants from India that MQM represents, constituted blasphemy because Prophet Muhammad (may peace be upon him) was himself a muhajir. Rimsha, a Christian girl accused of blasphemy, being escorted to safety in Islamabad in 2012. Credit: M Arif/White Star. Courtesy of Herald. Wednesday is meeting day at Shadman jail in Lahore. Irfan Prince hands over his identity card and his cell phone to the guards at the entrance hall to the prison and receives a parcha in return. He then peers at the clock at the opposite end of the room. It is load-shedding time, which means that only the central column of ceiling fans, directly above the cubicles of jail officials, is functioning. A woman in the ladies section fans herself with her white chador and keeps looking up at the ceiling and then glaring at the police wallas. The walls have Quranic verses displayed on them – sponsored by Shezan, a soft drink maker. As soon as the clock strikes 2 pm, the time when the meeting starts, Prince rushes to the security counter, gets his food checked and then rushes to the tuck shop and gets a cold bottle of mango juice. In his hurry, he looks younger than he is. He then dashes towards what is titled mulaqaat shed, or the shed for the meeting. He hangs his backpack on a nail at the entrance, turns around the corner and disappears into a narrow pathway that ends at a gate with iron bars. Behind the bars are inmates. Most of them have been jailed for blasphemy. Among them is Prince’s brother Adnan, a former pastor. Adnan was accused of writing blasphemous words on a book, about a month and a half after the twin bombing of the All Saints Church in Peshawar in 2013 had killed 80 Christians (rights groups say there was a rash of blasphemy accusations immediately after that attack — they are not entirely sure why). He said the book did not belong to him and that it was found in a shop in Lahore where he was covering a shift for his brother, Prince. He was accused of blasphemy the very next day after the offending words were found written on the book. He fled. He, his mother and his brother went to their family in Youhanabad, a Christian slum on the southern edge of Lahore. 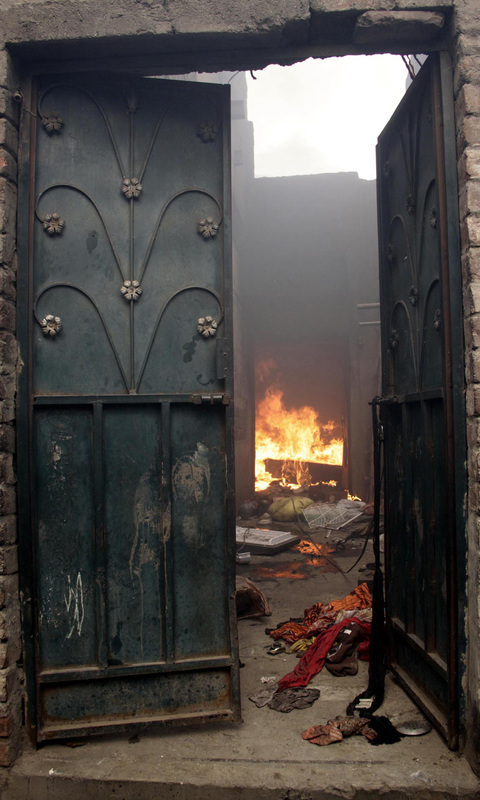 But the community there, worried by what had happened in Joseph Colony, another Christian neighbourhood in Lahore set on fire just a few months ago, told them to leave. Adnan went into hiding. Prince and his uncles – his father having passed away a long time ago – were arrested and told they would not be allowed to leave until Adnan surrendered himself. And so he did. 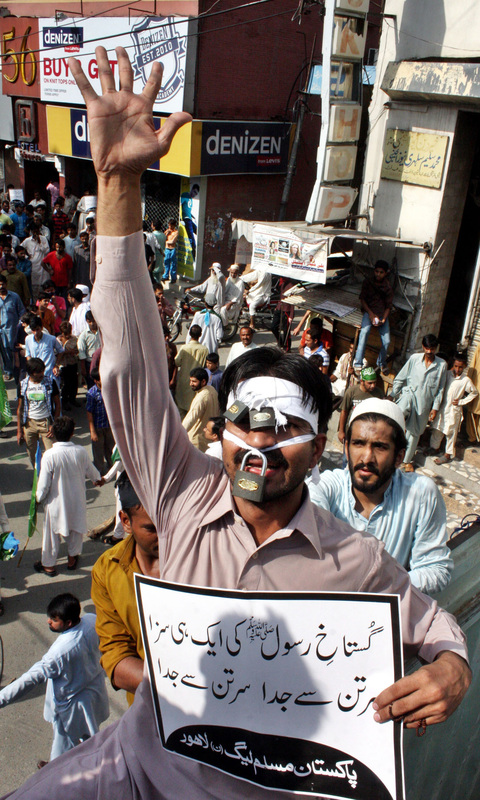 A young boy in Islamabad in 2012 protests against an anti-Islam film and the publication of blasphemous caricatures. Credit: Tanveer Shahzad, White Star. Courtesy of Herald. Adnan sips the mango juice, the bottle steadily perspiring in the heat, with the straw that his brother has carefully angled through the bars. His own face glistens with sweat. “We’ll see you next week,” Prince tells him. But the judge hearing his case goes away on holiday. Next week stretches into next month. Even as freedom becomes increasingly elusive for Adnan, the spectre of a death sentence looms large – or, worse still, death at the hands of an inmate or a police guard incensed by his alleged act of blasphemy. John Joseph, a Roman Catholic bishop in Faisalabad, was highly wary of the treatment of Christians facing blasphemy trials. In May 1998, he shot himself with a pistol in front of a court in Sahiwal in protest against a death sentence handed down to one Ayub Masih. Yet, not every Christian in Pakistan opposes the blasphemy laws. Many activists – both Muslim and Christian – and many church leaders have argued that the Islam-specific provisions of the blasphemy laws, indeed, should cover the holy personages and religious texts of all religions. It was precisely this position that the former Chief Justice of Pakistan Justice Tassadduq Hussain Jillani took when, according to Dawn, he remarked during the hearing of a case in May 2014 that “offence against any religion comes under the blasphemy law”. Nobody no longer says openly that the blasphemy laws need to be repealed on the ground that they violate human rights. The first trial that Ghulam Mustafa Chaudhry – the Lahore-based head of the Khatm-e-Nabuwwat Lawyers’ Forum – formally worked on was that of Muhammad Yusuf Ali, who was accused of posing as a prophet in 1997. This is not the name by which Chaudhry refers to him, however. He calls him Yusuf Kazzab — kazzab meaning ‘liar’ in Arabic, an epithet given throughout Muslim history to people claiming prophethood or betraying Islam in some way. An epithet popularised in this case by daily Khabrain, which was then a relatively new Urdu newspaper and was trying to establish its readership. Yusuf Ali is said to be a shareholder in the office building on Lahore’s Lawrence Road that houses daily Khabrain’s headquarters. It is not clear whether or not this point came up during his trial. Yusuf Ali was convicted and sentenced to death in 2000, three years before the parliament would make the last real – but eventually aborted – effort to amend the laws. As it were, he was murdered while in prison by another inmate, Tariq, who was on death row (the gun with which Yusuf Ali was fired at was taken into the prison reportedly by an employee of daily Khabrain). The murder inspired the movie Aik Aur Ghazi, directed by Syed Noor and released years later in 2011 – curiously just months after yet another ghazi had entered the public consciousness: Mumtaz Qadri. Noor insisted that he was not trying to cash in on the prevailing sentiments on the subject. In any case, the film flopped. Chaudhry, who was a part of the legal team for Qadri’s defence, says he has full faith in the legal system. If the courts do justice, there will never be any problem, he says on a hot summer day in 2015. At that point Qadri’s case was in its final appeal. Chaudhry proclaims that Qadri was justified in doing what he did because there was no way that Taseer, the sitting provincial governor, could have been taken to a court for making remarks about the blasphemy laws. Chaudhry does not think that his association takes up blasphemy cases disregarding whether they are fake or genuine. All cases are investigated before the lawyers take them up, he says. As of last summer, they were handling from 500 to 600 cases. He says he did not take up the case that led to arson at Joseph Colony because the complainant was said to have been drinking with the accused. The imbibing of alcohol, turned Chaudhry off. But even in a state of inebriation, he insists, a Muslim will not tolerate an insult to Islam. Alizeh Kohari is a former staffer at the Herald and is currently a graduate student of comparative politics at New York University. The article was originally published on Herald.